WILLIAMSPORT, Pa. (AP) — Freak storms packing up to 100 mph winds hit Pennsylvania early Friday, sending floodwaters into hundreds of homes and causing a pipeline rupture that dumped more than 50,000 gallons of gasoline into a stream, threatening drinking water supplies. 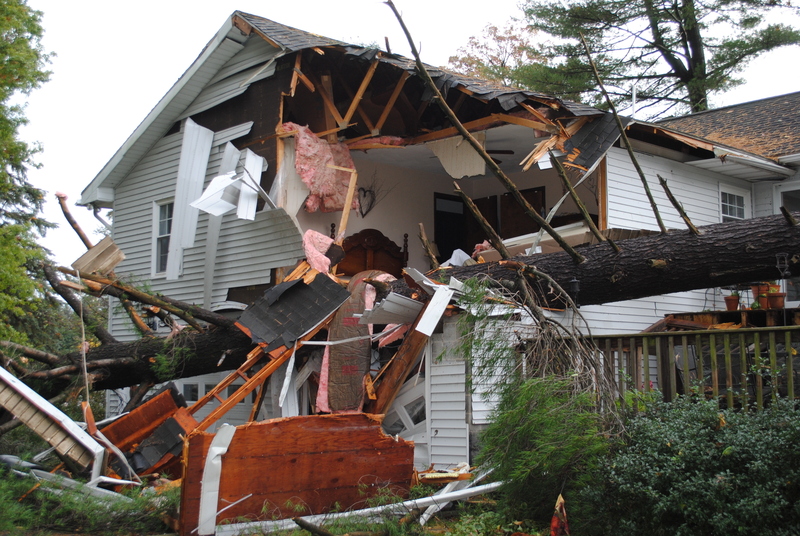 One man was killed when a tree crashed into his home. The storms dumped up to 7 inches of rain on western and central Pennsylvania, triggering mudslides, turning roads into rivers and sweeping away at least two homes. Hundreds more were damaged in Centre County, home to Penn State’s main campus. Gov. Tom Wolf ordered the state’s National Guard to help in the recovery efforts after the storm left a trail of destruction stretching 150 miles. The toll included downed power lines, destroyed vehicles and damaged railroad beds. The (Lock Haven) Express reported a popular retired teacher was killed Thursday night in Clinton County when a tree crashed into his home. The man had been on the second floor and was tossed from his home by the impact, landing on his back in the driveway. Winds there reached up to 100 mph, said National Weather Service meteorologist Craig Evanego. About 100 residents were forced from their homes in the Bald Eagle Valley, including about three dozen residents of a personal care home, Centre County Commissioner Steven Dershem said. In hard-hit Lycoming County, emergency crews used boats to help residents from their homes and survey the damage to roads and bridges. Firefighters banged on doors in Old Lycoming Township near Williamsport, evacuating residents in the middle of the night. “We thought nothing was going to happen, then all of a sudden, a few minutes later, the whole road was covered in water,” resident Brent Getger told WNEP-TV. “It was crazy because I was woken up by my sister. She said we have to evacuate, we have to get everything packed up,” he said. The flooding caused a Sunoco Logistics gasoline pipeline to rupture, spilling an estimated 54,600 gallons into a tributary of the Loyalsock Creek and threatening the water supply of several thousand customers. Pennsylvania American Water said its treatment plant along the Susquehanna River in Milton — downstream of the spill — might be impacted, and asked customers to conserve water in case the plant had to be shut down. Residents would be served by a second, unaffected treatment plant if the Milton plant had to be taken offline, the company said. Two other water systems, serving customers in Sunbury and Shamokin Dam, are also potentially impacted by the spill, according to the state Department of Environmental Protection. Sunoco Logistics said crews were using skimmers to remove gasoline from impacted waterways and erecting containment booms downstream. The storm took most residents by surprise. Mark Collister was trapped in his Old Lycoming Township mobile home Thursday night when a stream spilled chocolate-colored water from its banks and blocked the road. “We knew we were going to get the rainstorm, but not as quick as it was,” he said. The water had receded enough for him to get to work Friday, but, with more rain in the forecast Friday night, he left early. Other residents took advantage of the lull Friday to start cleaning up, power-washing mud from their homes. Jim Heverly, who lives less than 50 feet from Lycoming Creek and was forced to evacuate, called it the worst flood to hit his neighborhood in more than a decade. At least one bridge across the Loyalsock Creek in Montoursville was wiped out, according to Ruth Miller, spokeswoman for the Pennsylvania Emergency Management Agency.